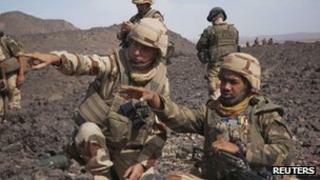 British troops have begun arriving in Mali to help train Malian soldiers as part of an EU training mission. The UK is also providing surveillance and logistical support to French troops who are helping the west African nation counter an Islamist insurgency. Some 21 members of the 1st Battalion The Royal Irish Regiment arrived on Tuesday, the Ministry of Defence said. The Secretary for Defence Philip Hammond said combat troops will not be deployed. The Royal Irish troops will be joined by members of the 45 Commando Royal Marines and 29 Commando Regiment Royal Artillery completing a team of 40 from the UK. Mr Hammond said: "Through this mission we will support the Malian government to counter the violent insurgency that has not only disrupted their country, but which also poses a clear threat to our national interests here in the UK." The training will take place north-east of Mali's capital Bamako, under the control of French Brigadier General François Lecointre and is expected to continue for around 15 months. More than 200 instructors will be deployed in total, as well as mission support staff and force protection, making a total of around 500 staff from 22 EU Member States.